For women's sizing, simply add 2 sizes up. Ex. A men's 4 is a women's 6. Not sure which insole is right for you? Visit the buying guide at fpinsoles.com. Every foot is shaped differently. This is why stock shoe insoles are flat. 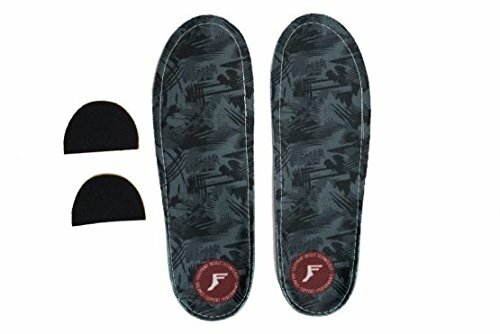 FP insoles "Game changers" mold to your exact foot and provide firm support, biomechanical joint stabilization and improved balance. Finally, a real custom orthotic without doctor's fee's lab visits, high expenses and long waiting. 1. Heat in the Oven (DO NO USE MICROWAVE): heating to 225 DegreeF for 5-8 minutes causes the inner arch chamber to soften and expand allowing the insole to take the exact shape of any arch 2. Molding Process: The insole takes the unique shape of the foot and becomes firm as it cools down. Firm enough to truly support the skeletal structure. Place in shoe and walk for a dynamic mold, Stand on the insole for solid mold, Sit and apply moderate pressure for an arch building mold. 3. Enjoy the Benefits of a real custom orthotic: Normally, as the muscles in your foot get tired or when taking heavy impacts, your arches will start to collapse. This leaves you prone to injury and soreness as your joints stop working in alignment. Game changers increase balance and performance time, stop the arch from collapsing (over pronation), prevent arthritis from uneven cartilage wear and acute injury such as torn ACL 4. Remold to new shoes: Many shoes have different widths so buying a custom orthotic from a lab will achieve different results in different shoes. Game changers can simply be remolded to new shoes. Patent pending design. If you have any questions about this product by Footprint Insole Technology, contact us by completing and submitting the form below. If you are looking for a specif part number, please include it with your message.